MISHAWAKA — Students at Bittersweet Elementary School saw one of their poems become an instant song during a presentation at their school. . . . Click here to read the complete article. world . . . Click here to read the complete article. Jim Valley has an innate desire to make the world a better place. His simple blueprint for change? Inspire and instill in the younger generations the idea of respect, friendship and peace so that they, in turn, can have a positive impact on the world . . . Click here to the read complete article. Jim’s work operates on the understanding that children learn in many different ways and one way to help students learn to read is through musical/ rhythmic intelligence. This is a language related intelligence, which begins with a degree of sensitivity an individual has to the pattern of sound and the ability to respond emotionally to these sound patterns. . . . Click here to read the complete article. “Jim Valley is coming! 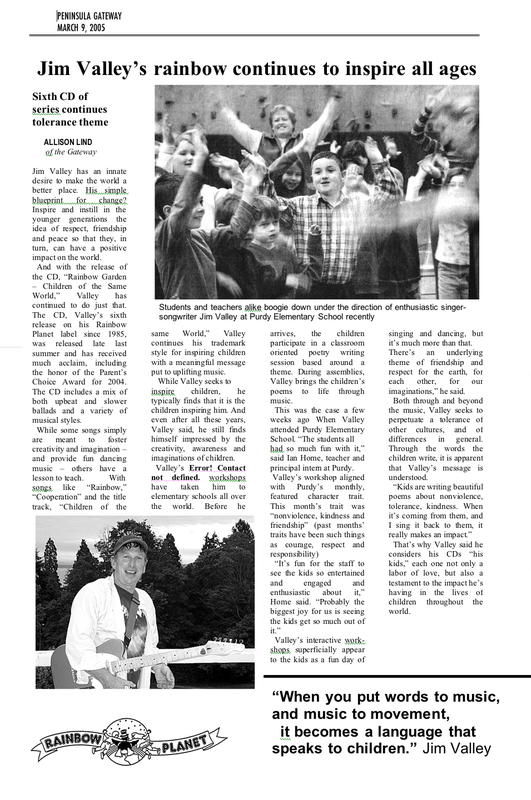 Jim Valley is coming!” rang the cry of elementary school children throughout Huntley over the past couple weeks. Musician Jim Valley is probably known to adults as a member of the ‘60s band “Paul Revere and the Raiders.” But to children, Valley is more like a big kid himself. . . Click here to read the complete article. You might think it was his vibrant tie-dyed socks sticking out from his sandals that kept the children’s eyes on Jim Valley this week. But spend just moments watching this one-time member of Paul Revere and the Raiders, and there’s no mistaking it: Children love this man. He sings for them, he sings with them, and he tells them they are special. But he tells them from his heart, and children, wise in ways we are not, know beyond a doubt he is sincere. . . It brought chills to the spine to see the room full of kindergartners through sixth graders singing with all they had and hand motions down pat. Most interesting of all was the way he brought them singing with great emotion, and the next moment the crowd was perfectly silent talk about in the palm of your hand! I can tell you that Jim Valley orchestrated his crowd with virtuoso finesse. Like any good performer, he left them wanting more. I’ll bet it was the shortest hour most of those kids will have all year, thanks to the power of Jim Valley. An internationally known Pied Piper of peace, love and understanding ambled merrily into town Thursday morning. And he stayed late into the afternoon, entertaining and enlightening young people of assorted race and ethnicity at Gifford Elementary School. Jim Valley—a grandfather of four who turns 56 on Saturday—spends September through May day-tripping around the world, bringing his special message of creativity and imagination to multinational school children from the four corners of the Earth. An energetic outgoing performer, Valley’s local appearance featured four separate one hour sessions. Though divided by grade level, they were linked by enthusiasm. Even shy-looking youngsters appeared to lose all inhibition under his mesmerizing encouragement. Those in Janet Wall’s and Sue Leaver’s class clapped loudly when Valley gave an improvised rock beat to their collaborative poem, Friends.